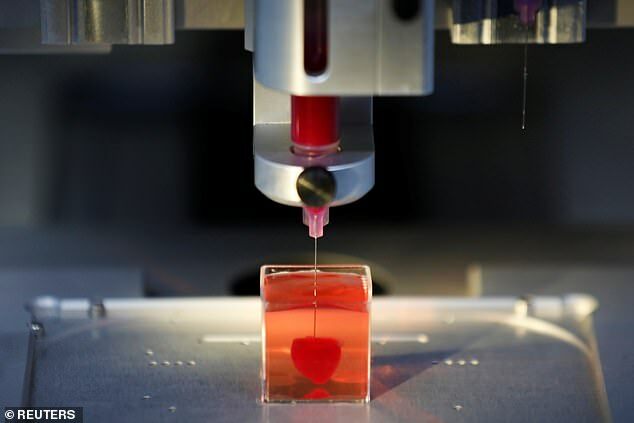 A lab in Israel unveiled a 3D print of a heart with human tissue and vessels on Monday, calling it a first and a "major medical breakthrough" that advances possibilities for transplants. Although the organ is only the size of a cherry and cannot pump blood, experts said its creation is a 'major medical breakthrough'. The heart is believed to be the first ever to have been printed with cells, blood vessels and chambers. The hearts will need more work before they can pump blood, the scientists hope to begin trials using them within a year. People have managed to 3D-print the structure of a heart in the past, but not with cells or with blood vessels, he said. In theory, the technique may one day be able to produce someone a new heart using recycled cells from their own body – reducing the risk of it being rejected. 'Maybe, in 10 years, there will be organ printers in the finest hospitals around the world, and these procedures will be conducted routinely,' said Professor Dvir. But he accepts it may be safer to start transplants with an organ less crucial than a heart. The spleen, appendix, gall bladder and kidney – and even a lung – can be removed without killing the patient, for example, so could be candidates for trials. 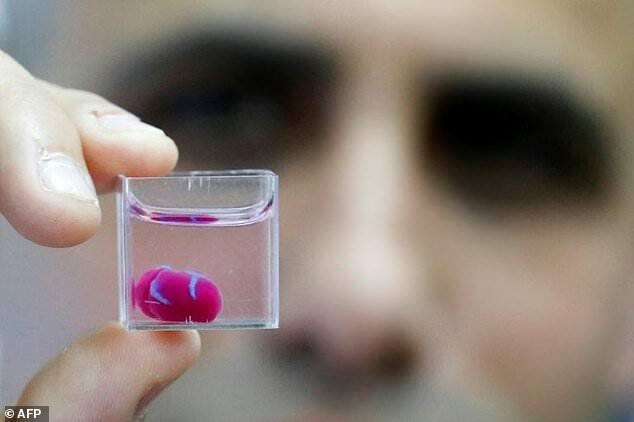 The next stages of the Israeli team's research will be trying to teach the 3D-printed hearts to beat like living ones. And then they will attempt to transplant the lab-grown organs into animals, which they hope to be able to do within a year, Professor Dvir said.